Variety Rice recipes have become ideal Lunch Box Recipes. I myself have posted more than 20+ variety rice recipes. But we should also consider seasonal factors like peak summer when selecting particular variety rice. 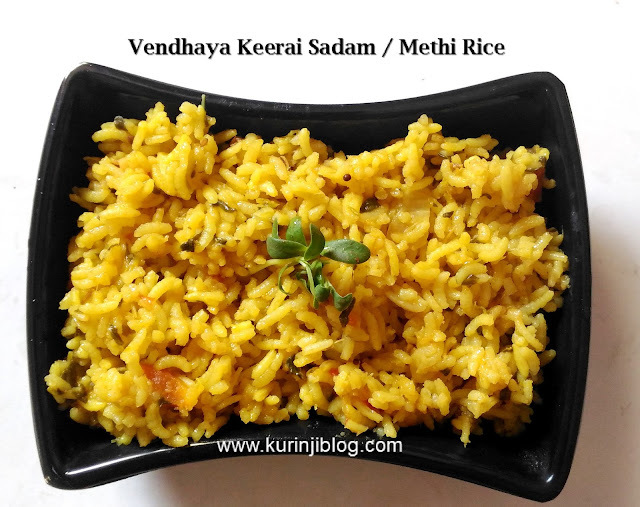 Vendhaya keerai / Methi leaves is a coolant and therefore very good for summer. Try atleast once and I am sure you will like it. Click HERE to view 20+ Lunch Box Recipes. 1. Clean and wash the methi greens / fendhaya keerai. Drain the water completely and cut them into small pieces. 2. Heat the oil and ghee in a pressure cooker. 3. Add mustard seeds and wait for popping. 4. Add cumin seeds and wait for splutter. 5. Add chopped garlic and sauté till they become soft. 6. Add chopped onion and sauté till the onions become translucent. 7. Add chopped tomatoes and fry till the tomatoes become mushy. 8. Add chopped greens (from 1) and fry for 2 mins. 9. Add turmeric powder, sambar powder and salt. Mix them wll. 10. Add enough water and rice. Mix them well and pressure cook for one whistle in high flame. Then bring the flame to medium. Then cook for 3 more whistles in medium flame. 11. Allow it to cool down completely. After pressure has gone, open the cooer and mix the rice gently with fork. Again drizzle few drops of ghee if you want. Yummy and helthy venthaya keerai sadam is ready to serve. erve it hot with Fryums. 1. As I am using normal rice, I have used Rice to water ratio as 1:3. You should change the ratio according to your rice variety. 2. You can also soak and use the rice. But ensure that you are using the water also instead of throwing it away. 3. I have mixed ghee with the rice for taste. You can use oil if you don’t prepare ghee. 4. You can also use the tender stem also. 5. 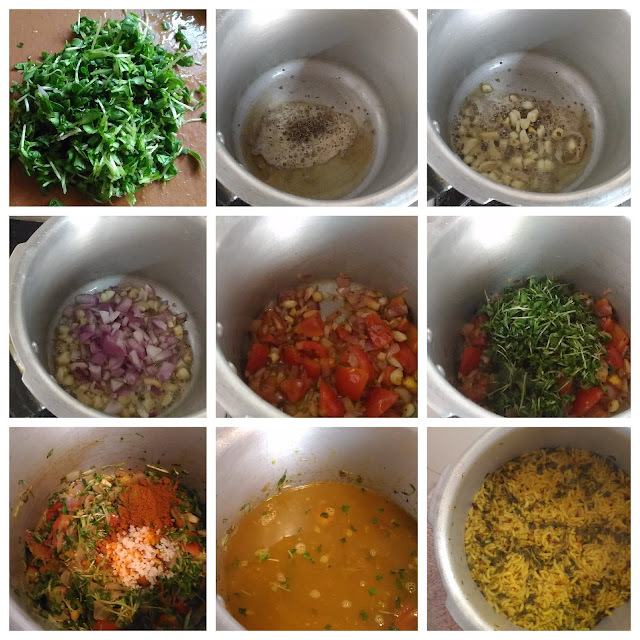 You can chilli powder and coriander powder instead of sambar powder.